While there is no doubt that LSU is doing good work for the community and world at large, with many humanitarian efforts and opportunities for community service, it is misleading for LSU to present the suggestion to future parents and students that an education obtained at LSU will promote faith in all of the fundamental values of the SDA Church as an organization. Sure, the SDA Church does stand for service-oriented activities toward the local community and toward the world community at large. Hopefully all Christians of all denominations stand for at least this much of the basic Christ-like attitude toward those in short supply of the most basic of human needs. However, the SDA Church, as an organization, also has a Gospel Message of hope in a bright literal future which is based on very real physical evidence. These unique beliefs have been given the label of â€œfundamental doctrines.” Often those who have tried to uphold these Gospel doctrines have been derogatively referred to as â€œfundamentalistsâ€ and have been labelled as â€œextremists.” This perspective is held by many at LSU â€“ especially within LSUâ€™s science departments. The problem with LSUâ€™s PR advertisement is it fails to mention its science department is decidedly in support of the mainstream evolutionary view on origins. LSU science professors actively promote the idea that life has existed and evolved from a common ancestor on this planet over the course of hundreds of millions of years. Beyond this, they belittle and scoff those who publicly admit to believing in a literal creation week and a worldwide Noachian Flood in recent history â€“ calling those who hold such antiquated views the â€œlunatic fringeâ€ in their classrooms and even in public press. So, while â€œfaithâ€ may indeed be formed at LSU, what kind of faith is it?Certainly it’s not a faith in some of the most basic and most cherished of all SDA ideals. Rather, it is a faith in the truth and validity of Darwinian thinking. Is that what the SDA Church really wants for its own church schools and paid representatives? â€“ paid with the tithe monies and steep tuition fees from parents and constituents who think they are obtaining the best that â€œSDAâ€ education has to offer? I would hope not. It is about time LSU comes clean and at least admits what its own faculty actually stand for and teach as the gospel truth in their own classrooms. Why the need for more slick PR compaigns that give a false impression about what LSU is all about? â€“ when it comes to all that it clearly stands for? For me this very sort of false advertising is far more upsetting than LSU professors promoting mainstream evolutionary thinking in the classroom. Personally, I would far rather see LSU come clean about what it is in fact doing rather than to see these continued efforts to cover up or evade direct questions about what is truly going on. January 21, 2010 in LSU. How much emphasis should be on SDA beliefs instead of Biblical teachings? You can definitely show that the two are one and the same, but it also does not alienate most of the Bible believing community, and brings other Christians into the fight for truth and the teaching of such. @Rick Baskett: I think the introductory paragraph to our fundamental beliefs addresses your question. Rick Baskett: How much emphasis should be on SDA beliefs instead of Biblical teachings? You can definitely show that the two are one and the same, but it also does not alienate most of the Bible believing community, and brings other Christians into the fight for truth and the teaching of such. I don’t think it a bad thing to point out or to explain why our SDA Church, as a Bible-based organization, is unique among all Christian organizations in certain of its biblical interpretations. I don’t think this is a bad thing at all or that it would unnecessarily alienate those denominations who also support our perspective on a literal creation week. Many Christian denominations do not support this particular biblical interpretation – despite the obvious intent of the biblical authors to be taken as describing real historical events. This is why it is very important for the SDA Church to take a decided stand on this issue. If we loose out here, we loose just about everything that makes us relevant as a unique Christian organization. There would simply be no point to being “SDA” anymore if there really was no literal creation week. This is why the attack of many of LSU’s science professors on the reality of the creation week, in favor of a Darwinian view of origins, is so destructive to the SDA Church and to the basis of the Gospel’s ‘Good News’ as interpreted by the SDA Church – as an organized body. So, while â€œfaithâ€ may indeed be formed at LSU, what kind of faith is it? Certainly itâ€™s not a faith in some of the most basic and most cherished of all Biblical ideals. Rather, it is a faith in the truth and validity of Darwinian thinking. Is that what a Biblical Church really wants for its own church schools and paid representatives? â€“ paid with the tithe monies and steep tuition fees from parents and constituents who think they are obtaining the best that â€œBiblicalâ€ education has to offer? I would hope not. I would rather emphasis be on the Bible and biblical teachings which unites us SDA Christians with other Christians all over the world. The belief of a literal creation week is not unique to SDA Christians. Maybe this fight at LSU should only be an SDA issue, it should be taken care of “internally”? But it seems to me that this is just a symptom of something much much larger than the SDA church, since many denominations are fighting this fight. It takes a unification of all brothers and sisters, not just SDA brother and sisters to fight. Im not trying to disparage our church or it’s place in the kingdom of Christ. Im just saying that we should point back to the Bible. There is too much history in every single denomination, SDA included, that had teachings that deviated from Biblical truth. Psychologically people think about this when we credit a church instead of the Bible on a teaching. January 21, 2010 How much emphasis should be on SDA beliefs instead of Biblical teachings? You can definitely show that the two are one and the same, but it also does not alienate most of the Bible believing community, and brings other Christians into the fight for truth and the teaching of such. That is true – but since this is taking place inside a private university – it does not hurt to note that the denomination sponsoring that university has a mission and doctrinal statement – totally opposed to the doctrines on origins found among believers in evolutionism. In one respect – this may actualy benefit an SDA – Baptist style bridge since a large number of Southern Baptists (as just one example of a non-evolutionist group) also do not agree with the junk-science proposals of in the religious system we call evolutionism. I don’t see how the focus of this discussion excludes other Bible believing Christians from full participation. Rick Baskett: I would rather emphasis be on the Bible and biblical teachings which unites us SDA Christians with other Christians all over the world. The belief of a literal creation week is not unique to SDA Christians. Maybe this fight at LSU should only be an SDA issue, it should be taken care of â€œinternallyâ€? But it seems to me that this is just a symptom of something much much larger than the SDA church, since many denominations are fighting this fight. It takes a unification of all brothers and sisters, not just SDA brother and sisters to fight. I like your reworded version very much. However, I would also point out that there are many Christians and entire Christian denominations who honestly think that the modern theory of evolution is compatible with the Bible. This is why simply saying that we should support the “biblical perspective” isn’t clear enough given the current environment and dichotomy of views between many Christian denominations as to what the biblical perspective really is. There simply is no unified agreement, even within Christianity, on the topic of origins and what the biblical authors have to say about origins. This is partly the reason why those opposed to a literal interpretation of the biblical account of origins can make this issue appear to be so confusing – even for Christians. Sean, point heard and taken. 🙂 We are talking about a specific “biblical perspective”. I didn’t think your post was ambiguous at all on what that “biblical perspective” was, since it is this post that we are talking about and not just generalities. I have the same feelings about the General Conference. Why don’t they come clean and openly acknowledge the danger that Seventh-day Adventists face in Seventh-day Adventist institutions and churches? The Seventh-day Adventist Church has a reluctant prophet who believes that God gave him an inspired dream about the cover up going on at the General Conference, but he has no interest in putting his good standing with the Church in jeopardy. Isn’t his cowardice in the face of a terrible crisis typical of virtually all Church leaders? The first half of his dream depicts the GC conspiracy in extraordinarily vivid terms. I understand the symbolic meaning of the entire dream but feel that I should wait for the reluctant prophet to interpret it. “As it began, I was driving on a beautiful, winding country road. There were magnificent green trees all along the way, and shafts of sunlight were permeating the greenery at intervals. It was exceedingly peaceful. I came to a street or long driveway intersecting upon my right, and pulled the car off the road to take a look. The road led quite a way to a rather large building that had an ominous feel to it. The building itself was not unusualâ€”just a single-story, normal-looking office style. I often pulled over and looked at this building on my way home, just as I was then. There was just something about it that wasnâ€™t quite right; at this time I canâ€™t remember what set it apart from others. It seemed that there was an inordinate amount of security and secrecy there. I could never tell from my stops whether it was a government building or a research facility, but it certainly had that feel. My curiosity was natural; in the dream I was a newspaper reporter, perhaps an investigative journalist of some type. I pulled away, and continued to my home. It is not our policy to allow anonymous comments, but we felt it would be important to show this one. It is disturbing for me as a student at this University, to see people belittling the education I am receiving here. I am offended that you consider my decision to be a student missionary…a decision I made after meeting with others on this campus, be credited to Darwin. No, it IS my faith in the fundamentals of our SDA ideals that lead to my decision and I am thankful for this University to inspire so many of us to do this. I am also perturbed that you would disregard my involvement with ministries on campus. I, along with countless others from campus assist in worship program each week. Are you again saying that I should blame my University for empowering me to be thusly involved? Monday night, Tuesday night, Wednesday night, University Worship, Friday night vespers, Sabbath School…what else do you want me to go to?! I’m glad my parents and all of the people who pay tithe believe in me and this institution so that I can walk into various classrooms and have teachers pray before we start. I’m lucky to have the chaplains office, deans and other faculty and staff stay up until midnight with us if we need to talk. What other campus has such large number of alumni that return to work at the University because they love it. Why would you want me to leave a school where I can find faculty and staff at all sporting events, midnight feeds, eating with us in the cafe, giving us rides when they see us walking to the grocery store, loaing us their textbooks when we can’t afford them, encouraging us to think globally, hosting dinner or movie nights at their homes for international & dorm students over break who couldn’t go home, etc. Look at what the add says. Those are my friends. This is our campus. We do have service-learning, there are countless number of hours that people put into being involved in causes or just feeding and clothing those around us. We do have missionaries out in the world. Spring baptisms are a highlight on campus each year. Do you have a problem with this?! Should I slay administration for the chance to learn at the feet of my dedicated professors? I for one am not being spoon fed life. Maybe others in our denomination feel that they need to be nursed in all aspects of their Christian walk, but I am thankful that the resources have been laid before me here at La Sierra and that I am able to choose my own will…praise God for giving us choice. Now can you please stop causing chaos here…I’m trying to study. @Concerned LSU Student: You are missing the point being made entirely. We’re pointing out that LSU biology department is misrepresenting the university and the church’s belief in a recent, six-day creation. What on earth are you talking about? While your faith may be strengthened at LSU, can you say truthfully that the LSU biology department is strengthening your “faith in the fundamentals of our SDA” church? I am offended that you consider my decision to be a student missionaryâ€¦a decision I made after meeting with others on this campus, be credited to Darwin. Are you serious? Who is attacking your decision to be a student missionary? And what on earth has that got to do with anything on this website? I am also perturbed that you would disregard my involvement with ministries on campus. Nameless student, you are creating red herrings. We, and the church at large, are taking issue with LSU biology professors blatantly proselytizing Adventist students in the theory of evolution. LSU doesn’t even offer a science class taught from a creationist point of view. A couple of the biology professors have openly ridiculed students who have attempted to defend creationism in class. LSU’s mission work, chaplains, or spiritual interest is not in question. I’m sorry Nameless Student, but you have nothing to be offended about in your comment. You’re getting offended over issues that aren’t even being raised or addressed on this website. In fact, your complaints have been somewhat cliche of those defending LSU. LSU promotes the theory of evolution and that’s what we’re telling everyone, and all you come here to talk about is how you’re offended that someone thinks your decision to be a missionary was credited to Darwin? When it comes down to it LSU can’t deny the allegations, and neither can any of the students. All they do is extoll all the great things LSU does. Great! I’m glad LSU is involved and doing those things, but those things aren’t the issue. And you know that. You’re stirring up dust over moot issues. Good post, Shane. Very contextual and logical response to Concerned SDA Student. Now let us read all the people that disagree with your response as they contextually and logically respond to you. It is disturbing for me as a student at this University, to see people belittling the education I am receiving here. I am offended that you consider my decision to be a student missionaryâ€¦a decision I made after meeting with others on this campus, be credited to Darwin. 1. We first “notice” that you – quote no one, in your claim that someone here has argued that Darwinism is helping LSU promote student missions. 2. IF such a “Darwinism is helping LSU” argument WERE being made here – it would have to come from the side that argues “Darwinism is helping LSU” in general instead of the group here that argues “Darwinism is hurting LSU”. Thus your opening effort seems to have backfired. Those arguing against evolutionism at this site would all have predicted that at LSU – the students that decided in favor of student missions – would be doing so “BECAUSE of the student’s acceptance of SDA doctrines and IN SPITE of the all-for-darwin focus in LSU Biology classwork “. As it turns out – the Orthodox Adventist position generally credits SDA doctrines (God is Creator AND Savior of the World — for real) for inspiring students to commit to missions. I am also perturbed that you would disregard my involvement with ministries on campus. I, along with countless others from campus assist in worship program each week. Another good example of “quoting no one” to make the empty accusation above. Are you again saying that I should blame my University for empowering me to be thusly involved? Monday night, Tuesday night, Wednesday night, University Worship, Friday night vespers, Sabbath Schoolâ€¦what else do you want me to go to?! Iâ€™m glad my parents and all of the people who pay tithe believe in me and this institution so that I can walk into various classrooms and have teachers pray before we start. Iâ€™m lucky to have the chaplains office, deans and other faculty and staff stay up until midnight with us if we need to talk. Well – you seem to have plugged into every single positive ministry the University has – all in one “anonymous” student – or marketing rep. Either way – you make a good point about the “trains running on time” at LSU. We all agree that many positive things happen at LSU. WE agree that coummunism kept the trains running on time – ant the Nazi’s fed and educated the german orphans. However “doing something good” is not a good sort of “cover” for infecting an SDA teaching institution with false doctrine on origins found in evolutionism. What other campus has such large number of alumni that return to work at the University because they love it. Why would you want me to leave a school where I can find faculty and staff at all sporting events, midnight feeds, eating with us in the cafe, giving us rides when they see us walking to the grocery store, loaing us their textbooks when we canâ€™t afford them, encouraging us to think globally, hosting dinner or movie nights at their homes for international & dorm students over break who couldnâ€™t go home, etc. Look at what the add says. Those are my friends. So since the faculty are “good friends with students” we should not complain if some of them choose to reject 7 or 8 of our Fundamental beliefs and teach our students to do likewise?? There is such a thing as objective critical thinking as it turns out. Even students at LSU, will need to master that concept when evaluating their school. Surely your firm acceptance of Adventist beliefs would lead you to go to some other SDA school where not only are the faculty “friendly people” – they also just so happen to promote the actual fundamental beliefs of Seventh-day Adventist. Surely having BOTH benefits would be “of value” to such a missions oriented, SDA beliefs accepting student as yourself. This is our campus. We do have service-learning, there are countless number of hours that people put into being involved in causes or just feeding and clothing those around us. We do have missionaries out in the world. Spring baptisms are a highlight on campus each year. Do you have a problem with this?! Since you quote nothing from this web site showing a problem with those activities – and since all SDA universities engage in the same benefits listed above – I am not sure how this helps defend your “let LSU teach evolutionism as new SDA doctrine and ignore the damage it does” style argument. Should I slay administration for the chance to learn at the feet of my dedicated professors? I for one am not being spoon fed life. Maybe others in our denomination feel that they need to be nursed in all aspects of their Christian walk, but I am thankful that the resources have been laid before me here at La Sierra and that I am able to choose my own willâ€¦praise God for giving us choice. Now can you please stop causing chaos hereâ€¦Iâ€™m trying to study. If this anonymous person really is an LSU student – then several observations might be in order. 1. They probably are responding to ‘rumorous mis-characterizations’ of educatetruth’s claims without having digested the material on this site. 2. If number one is true, then this uninformed and somewhat naive person (who claims to be quite devoted to the Adventist cause) probably deserves a little less harsh treatment than has been offered by Shane and Bob. 3. Since this ‘students’ comments seem to be so far off the beam and so easily nullified by proponents of the educate truth stand – what would prohibit a ‘well-meaning’ educatetruth advocate (except Christian conscience) from foisting a fabricated straw-man onto this site for everyone to knock down – seeing as how it is anonymous? 4. If on the other hand some ‘well-meaning’ LSU administrator or biology professor had posted this ‘anonymously.’ I suspect it might have been a little more polished and purposeful. Taking jabs at even anonymous students probably doesn’t serve the educatetruth cause well. I would also hope that the sermons are more doctrinally sound now than in 1998. If faith is going to be formed at LSU, including during “worship options,” then students should not be hearing ideas presented as truth that explicitly contradict both the Bible and the Spirit of Prophecy. Concerned LSU Student: I am offended that you consider my decision to be a student missionaryâ€¦a decision I made after meeting with others on this campus, be credited to Darwin. Dear Concerned Student: I’m not sure where you found such a statement. I haven’t read everything here but I don’t remember anyone making such a statement. The people on this forum don’t necessarily agree with everything everyone else states. For the most part, those supporting Educate Truth agree that evolution should not be taught as fact in our schools. The positive things you speak of can only be attributed to God Himself. He is the author of salvation and is the one who has given you a heart for ministry. Please try to understand the concern of those of us who want our messages to be spoken holistically and according to our beliefs in our institutions. The fact that the negative effects of the teaching of evolution have not affected your faith is proof that the Holy Spirit is at work in your life. Even when we don’t agree, we should respect the other’s right to an opinion. It is heartwarming to know that your focus is on Christ. My prayer is that it remains there. 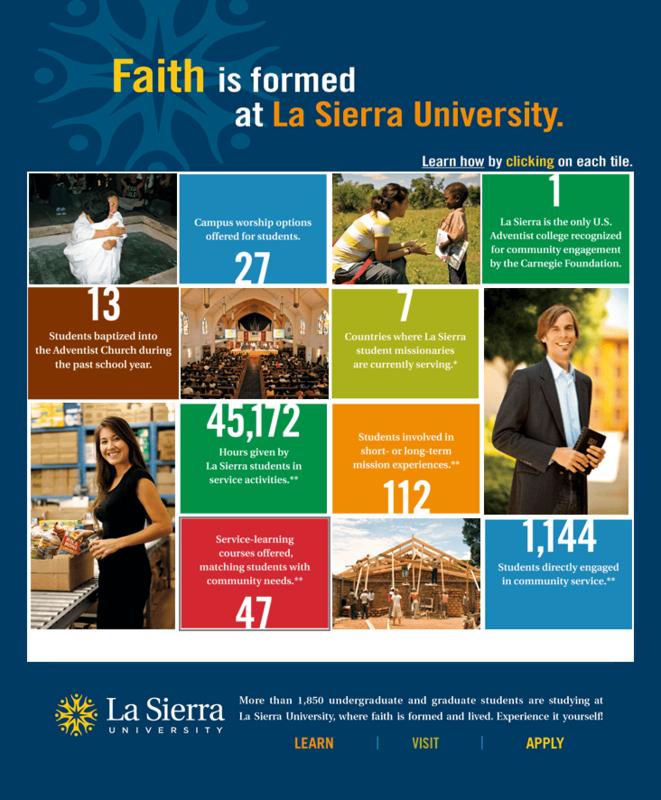 Of course there are great Christian teachers, mentors and students there at La Sierra. I don’t think anyone is suggesting otherwise. That isn’t the point really. The point is mainly that our schools should teach our beliefs. There are choices, but our perspective has very little voice in the greater world. It should be plainly presented with authority in our schools. The point that follows in regard to faith is that people who strongly believe the evolutionary world view are led down a path that leads to a loss of faith. Please don’t take my word for it. Think it through prayerfully. Research this idea. There are many statements you can find by evolutionists who claim it led to their loss of faith. It happened to me probably when I was around your age. It was a result of classes I took in a secular college. However, I was brought up Catholic. Later in life, after becoming grounded in the Adventist truth, I returned to a secular college. I was afraid that my faith would be shaken again, but found that the more I saw the complexities of life, the more my faith was strengthened. Surely a God who can change my life can transform an empty world in six days. Why not? But I am acquainted with the dark and lonely feeling that comes from a belief in evolution, in survival of the fittest, of tooth and claw! The logical end to that thought is atheism. I suffered from that for a brief but extremely dark and painful time in my life. Keep in mind that it is so much easier to see error when it is full blown and complete. When I neglect my garden because the weeds are tiny and hardly noticeable, I soon have a fight that I am unable to keep up with! If the poison is fed in cupfuls, no one will drink it! Don’t forget who is roaring about seeking whom he will devour! That one is clever and knows a miriad of ways to give dangerous gifts such as a trojan horse. Consider how many poisons can kill with only one drop and how easily some can be hidden. The best villain is one who appears friendly and comfortable to be around. Please know that my motive is a protective one toward the students at LSU (i.e. watch out for that villain Evolution), and I’m sure many others who post here do so with the same motive. Keep in mind that some of these responses to your post seem competitive and defensive. However, I’m sure the posters don’t mean any harm. They are defending their position because it is important. It’s important because you and your fellow students are important. So you are the root of our concern. Stay focused on Christ and thank you for expressing yourself. Notice that several problems have been raised about counterfeit doctrine on “origins” taught by the evangelists for evolutionism. 1. The degree to which the doctrines on origins found in the Bible and agreed to within Seventh-day Adventist fundamental beliefs — are directly apposed to the atheist-oriented model for the doctrine of “origins” found in evolutionism. 2. The confirmed history of fraud and blatant junk-science that plagues the model of blind guesswork so central to evolutionism. Junk science “stories” about “how one thing came from another” that are identified (even by atheist evolutionists themselves) as being “stories easy enough to make up – but they are not science”. 3. The degree to which proven science debunks the foundational mechanism of evolutionism — genome morphing being one of the more notable fictions within the evolutionist’s library of “stories easy enough to make up”. 2. LSU’s history of having “graduated many students” that then go on to one profession or another. Certainly ALL public universities in California’s educational system could proudly boast of the SAME values, goals and rich history of having “graduated many students” that went on to one profession or another. If LSU’s goal is to be the “BEST PUBLIC UNIVERSITY” that SDA tithe, tuition and offering dollars “can BUY” (only with the objective of doing so “INSIDE” the Adventist educational system) – then they have done a good job of laying out that set of values in their statement of affirmation. Personally I had hoped for a subtantially higher standard coming from that group. Oh well… Jeremiah 6:15 does say something about those who do not even know when to blush. And so – we continue to hold up this issue in prayer. @Concerned LSU Student: Good point, but the bad seed need to take out for the benefit of other students, not every one of you have the same foundation and we need there give the students a good foundation. This brings me to my conclusion: the most vocal critics of LSU and evolutionism in your Church (whom you seem to defend) happen to be those with essentially no valid credentials. This I find hysterical. The fact of the matter is, however, that, though certainly a distinct minority, quite a number of well-trained well-published scientists in every field of science question the validity of various fundamental aspects of the modern mainstream evolutionary view of origins – from the validity of the evolutionary mechanism (RM/NS) to explain the functional complexity of life to the notion that life has existed on this planet for billions of years. For example, you forget to mention Arthur Chadwick in your list. Ironically, he is an LSU graduate who currently teaches at SWAU. He has his Ph.D. in Molecular Biology from the University of Miami (with honors). His geological training is from the University of California, but because they will not give a second PhD, he has no degree from there. However, he was Visiting Professor of Geology and Geophysics at University of Oklahoma before going to SWAU. He also has quite a number of publications and is currently active in field research. The argument, of course, is not that such views are popular or even convincing to most scientists. The argument is that this is what the organizaed SDA Church claims to believe and support. Given this extraordinary claim by the SDA Church, the question is, does it, as an organization, really believe such notions as the literal creation week to be “fundamental” or not? Does it really support such views? If so, why does the Church hire those who actively counter such views on the Church’s dime? Is this not a form of schizophrenia? – not to mention false advertising to parents, students, and constituents? And, if the Church doesn’t mind the bold stand of LSU on the “academic freedom” of its professors to proselytize for theistic evolutionary views, on the Church’s dime, why is LSU trying to cover up the fact that this is in fact what its professors are doing? You only try to hide stuff you’re doing if you know what you’re doing is wrong. Otherwise, if you thought what you were doing was perfectly fine and even beneficial, why try to hide it? Why not advertise and promote it? Why do I even have to ask such an obvious rhetorical question? I don’t mind one bit that the most vocal creationists by worldly standards have no appropriate credentials in a legitimate science. The real problem is that mainstream creationists completely misunderstand the definition of science. Eugene Shubert: The real problem is that mainstream creationists completely misunderstand the definition of science. Are you sure about that Eugene? Or is this just another over-generalization? Forget creationists, even mainstream scientists donâ€™t agree on â€œtheâ€ definition of science. You certainly havenâ€™t presented a definition with which everyone agrees. The best and most irrefutable definition of science, as well as the set of all relevant variations of the essential idea in science, obviously exists. Science is whatever the discoverers of the laws of nature, i.e., what the noteworthy scientists, say science is. Where’s the error in letting the great consensus of accomplished investigators of nature define science? “Philosophy is written in this grand book, the universe, … But the book cannot be understood unless one first learns to comprehend the language and read the characters in which it is written. It is written in the language of mathematics.” â€” Galileo Galilei. “All science is either physics or stamp collecting.” â€” Ernest Rutherford. “The fundamental principle of science, the definition almost, is this: the sole test of the validity of any idea is experiment.” â€” Richard P. Feynman. Feel free to expand this list with the names of other famous scientists that you insist are in error at the level of mere definition. Eugene Shubert: The best and most irrefutable definition of science, as well as the set of all relevant variations of the essential idea in science, obviously exists. Science is whatever the discoverers of the laws of nature, i.e., what the noteworthy scientists, say science is. Whereâ€™s the error in letting the great consensus of accomplished investigators of nature define science? Because the consensus, even of “accomplished investigators of nature”, isn’t always right. That is to say, there is always a subjective element in the application of any scientific methodology when it comes to explaining the world in which we live. This is even true of groups of people who have the appearance of being very intelligent and well informed. Subjective bias is always an issue – even in science. The question is, how do you really know what you know? How are you so sure you are right? – or the opinions of those groups of people you think should be right are really right? The fact is that you cannot know the answer to this question with absolute certainty. You can be pretty sure, or even very sure, but you cannot be absolutely sure of any of your beliefs regarding the real nature of the world or universe in which you live. Mathematical tests are not enough to determine a true scientific theory from a false one. Even completely opposing theories proposing to explain a given phenomenon may both use mathematical tests and come up with “predictive value”. Which theory is correct? Mathematical tests may help you decide which one you think is correct, but they will not do so with absolute perfection. There will always be an element of uncertainty due to the subjective element that is always present in scientific investigations. â€œPhilosophy is written in this grand book, the universe, â€¦ But the book cannot be understood unless one first learns to comprehend the language and read the characters in which it is written. It is written in the language of mathematics.â€ â€” Galileo Galilei. Again, just because the universe may be written in the language of mathematics doesn’t mean that we can determine it with perfection. We cannot. There are limits to our understanding of the universe despite it being written in the language of mathematics. If there were no such limitations, science wouldn’t be needed. â€œAll science is either physics or stamp collecting.â€ â€” Ernest Rutherford. A humerus one-liner, but clearly an exaggeration – despite my own bias toward physics. â€œThe fundamental principle of science, the definition almost, is this: the sole test of the validity of any idea is experiment.â€ â€” Richard P. Feynman. Again, experiments wouldn’t be needed if science could produce definitive conclusions about the truth of the universe. The fact that scientific hypothesis and theories must be test and retested over and over again proves the idea that science can never produce truth with absolute perfection. The declarations of scientific conclusions must continually be subjected to testing and repetitive validation. This means, of course that scientific theories are always subjective to one degree or another and have the possibility of potential falsification. You need to read more about the “philosophy of science”… There are many famous scientists and philosophers who disagree with each other about the very nature of science itself – even the existence of a valid concept of “science”. I personally don’t agree with all of them of course. But the fact remains that there is still a great deal of debate over the nature and usefulness of “science”. It is almost meaningless to define science as the process of gaining knowledge about the physical or material world – or even “systematized knowledge in general.” We all agree that this is the goal of science. However, there is a great deal of disagreement over how or if this goal is ever reached in a truly objective sense by science. Because the consensus, even of â€œaccomplished investigators of natureâ€, isnâ€™t always right. I have been arguing for improving the definition of science, starting with what the world’s best scientists have said. I see that you are trying to define science by reciting the opinions of mediocre scientists. Mathematical tests are not enough to determine a true scientific theory from a false one. The point of my list is to show a respectable agreement on the true character of science, not to select one scientific theory above another. The perfect synthesis is achieved in David Hilbert’s philosophy of science. I have been arguing for improving the definition of science, starting with what the world’s best scientists have said. You obviously reject the very foundation of science. I have been arguing for improving the definition of science, starting with what the worldâ€™s best scientists have said. You obviously reject the very foundation of science. I haven’t rejected the foundation of science since I believe that scientific methodologies are the very best we have to approach useful concepts of truth. What I have rejected, is your suggestion that science can be made perfect, devoid of subjective biases and the potential for error or falsification. The point of my list is to show a respectable agreement on the true character of science, not to select one scientific theory above another. The perfect synthesis is achieved in David Hilbertâ€™s philosophy of science. Science is all about the ability to accurately select one theory above another competing theory or explanation. Which one among multiple potential explanations is most likely correct or at least most correct? That’s what science is all about… answering that question. David Hilbert, while indeed a very smart man who contributed a great deal to mathematics and the physical sciences, was mistaken in his most cherished idea that theoretical uncertainties could be eliminated from the physical sciences… or even from mathematics. Beyond this, Hilbert didn’t even deal with the problem of the subjective nature of the human scientist who thinks to employ scientific methodologies. As Kuhn first pointed out, the problem is that science is affected by the human element – by the past experiences or lack thereof of the human investigator together with the passions, desires, and inconsistent motives of the human nature. All of these affect, even if subconsciously, the interpretation of different scientists in different ways as they look upon the very same data. This is why different scientists who agree to use the same “methods” of investigation can and often do come to very different conclusions or interpretations of the very same data before them. This problem, as Kuhn notes, is inescapable. I’m sorry Eugene (aka: “The New William Miller”), but you also are subject to this very same problem – and are subject to errors in your thinking and understanding of the world in which you live. It is actually possible that your ideas of what you think is “true” could actually be wrong. The same is true for my ideas of what I think is most likely true. I could be wrong. So, I’m afraid that you have not eliminated the subjective aspect of scientific investigation. I know you claim that God talks directly to you and all in dreams and visions, but aside from this sort of direct Divine revelation, science is indeed subjective and imperfect, subject to error. But, if a person really does have direct Divine revelation regarding any particular phenomenon, as in your case, what’s the need for scientific investigation of it anyway? It all boils down to one simple question Eugene. That is, can you predict the future of anything in the world that exists outside of your mind with absolute perfection? Obviously, the answer to that question is no – at least if you are honest with yourself. What does this mean? It means that regardless of the scientific method you choose to use to help you in your prediction, you could still be wrong given the actual results of the test of your hypothesis/theory… hence the requirement for the testing of all scientific hypotheses/theories. I havenâ€™t rejected the foundation of science since I believe that scientific methodologies are the very best we have to approach useful concepts of truth. What I have rejected, is your suggestion that science can be made perfect, devoid of subjective biases and the potential for error or falsification. Sean Pitman, M.D. : Science is all about the ability to accurately select one theory above another competing theory or explanation. Which one among multiple potential explanations is most likely correct or at least most correct? Thatâ€™s what science is all aboutâ€¦ answering that question. No. Science is precisely what the great consensus of accomplished investigators of nature have defined science to be. Sean Pitman, M.D. : David Hilbert, while indeed a very smart man who contributed a great deal to mathematics and the physical sciences, was mistaken in his most cherished idea that theoretical uncertainties could be eliminated from the physical sciencesâ€¦ or even from mathematics. You are mistaken. Hilbert never asserted any sort of unusual claim about the possibility of eliminating uncertainties from the physical sciences. Yes. Hilbert had an overly ambitious plan but it had nothing to do with eliminating uncertainty. Sean Pitman, M.D. :Beyond this, Hilbert didnâ€™t even deal with the problem of the subjective nature of the human scientist who thinks to employ scientific methodologies. Naturally, since that problem isn’t a scientific challenge. Science doesn’t concern itself with the non-science of Kuhn. Eugene Shubert: Naturally, since that problem isnâ€™t a scientific challenge. Science doesnâ€™t concern itself with the non-science of Kuhn. Scientists are very much concerned with the subjectivity problem posed by Kuhn. It all boils down to one simple question Eugene. That is, can you predict the future of anything in the world that exists outside of your mind with absolute perfection? – without even the possibility of error for your “scientific” hypotheses or theories? You don’t know what it means to know something. You haven’t done the work necessary to understand science. Hard relativism holds that (1) truth is a function of framework, and (2) all frameworks are equally legitimate because they are only to be criticized on the basis of internal criteria. Soft relativism accepts the first point but denies the second. It is argued, following Karl Popper, that hard relativism is an indefensible position. A defense of qualitative evaluation based upon this position, therefore, will be equally shaky. Kuhn, however, is a softâ€”not a hardâ€”relativist. Thus, a more promising defense of qualitive evaluation may be found in a soft-relativist interpretation of Kuhn’s analysis of the nature of scientific discovery. Eugene Shubert: You donâ€™t know what it means to know something. You havenâ€™t done the work necessary to understand science. Why don’t you answer my question then? How do you know when you have done enough work to really know or “understand” something? How do you know that you know and that I don’t know? Can you “know something” about the physical world that exists outside of your mind with absolute certainty? Or, is it possible that what you think you “know” could be wrong? If it is not possible for your ideas to be in error, where is the need for “testing” hypotheses or theories in your idealized “science”? It’s a simple question… Could you be wrong? Is that possible? Why donâ€™t you answer my question then? “No matter by whom light is sent, we should open our hearts to receive it with the meekness of Christ. But many do not do this. When a controverted point is presented, they pour in question after question, without admitting a point when it is well sustained. O, may we act as men who want light! May God give us His Holy Spirit day by day, and let the light of His countenance shine upon us, that we may be learners in the school of Christ.” GW 301. I have explained, in great detail, my acceptance of scientific orthodoxy in the light of David Hilbert’s philosophy of physics. If you don’t know what the answer is from that perspective, then you are obviously admitting your ignorance of scientific orthodoxy. Can you â€œknow somethingâ€ about the physical world that exists outside of your mind with absolute certainty? Eugene, Why is it that everything you say seems to be critical, and simply for strife and debate? Perhaps you would show more eloquence from mere silence. JohnB: Eugene, Why is it that everything you say seems to be critical, and simply for strife and debate? I guess that it seems that way to you because you are opposed to the truth I speak and that you prefer the lies that you are being told. We are not to receive the words of those who come with a message that contradicts the special points of our faith. They gather together a mass of Scripture, and pile it as proof around their asserted theories. This has been done over and over again during the past fifty years. And while the Scriptures are God’s word, and are to be respected, the application of them, if such application moves one pillar from the foundation that God has sustained these fifty years, is a great mistake. He who makes such an application knows not the wonderful demonstration of the Holy Spirit that gave power and force to the past messages that have come to the people of God. Or worse — a rabbit trail going nowhere. Are you sure about that Eugene? Or is this just another over-generalization? As is plainly self-evident, that response is no defense unless the majority of noteworthy discoverers of the laws of nature disagree significantly on the definition of science. Sadly, the Intelligent Design movement is in denial. There is a significant agreement on the definition of science among world-class scientists. It is absolutely shameful for informed Christians to not know this. There is nothing Christian or logical in refusing to accept An Irrefutable Definition of Science. On the contrary – Intelligent Design is a science that has not only been proven – it has been proven to the point of commercial viability. Consider the case of the “SCAN” function of your radio tuner in your car. The purpose is to discriminate within one of the four basic forces of nature (EM) between non-intelligent background “noise” that is available in nature (rocks given access to an energy source for example) vs an EMW that shows “intelligent design” whereupon the tuner STOPS and lets the listener fine tune that finding to see if it is of interest. Since atheist evolutionists DO admit to a “designer” existing for some of the EM waveforms that are obtainable in that experiment – they do not object to the persuit of that branch of science EVEN though it is overtly discriminating between ID forms of EM waves vs NON-ID forms. Thus when it comes to other aspects of nature the atheist evolutionist will adamantly insist that no such test for ID is “science” yet in branches of science where this aspect is irrefutably proven to the point of commercial viability – they simply “ignore the elephant in the living room”. How “instructive” for the unbiased objective reader. How “expected” that our own LSU scientists would not be practiced in the exercise of critical thinking enough to present these blatanly obvious examples to the students. BobRyan: On the contrary â€“ Intelligent Design is a science that has not only been proven â€“ it has been proven to the point of commercial viability. Consider the case of the â€œSCANâ€ function of your radio tuner in your car. That’s a bad example Bob. All car radio tuners are built to focus in on signal strength, not intelligence. You are right though, such a radio could be built that could filter out loud noise but then the extremely annoying long screech that precedes public service alerts, which announce possible tornadoes, wouldn’t be heard. However, there is nothing new or special about intelligently designed filters that could detect intelligent signals for such a simple feat of engineering to be called a science all by itself. Do you have a degree in a scientific field Bob? There are entire scientific disiplines devoted to the concept of detecting the need for intelligent design – – to include forensic science, athropology, and yes, even SETI science. All of these mainstream sciences are based on the detection of evidence for intelligent design (ID). The same is true when it comes to detecting the need for ID behind certain features of biological complexity. One does not need to prove the need for “supernatural” intelligence (which is impossible for natural intelligences to do by the way) to determine that a very high level of intelligence was certainly required to produce high levels of biological functional complexity – with very high degrees of scientific predictive value. Those who argue that ID Theories produces no useful predictions in science are simply mistaken – even when it comes to mainstream sciences. The detection of the need for intelligent design to explain certain phenomena is most certainly within the realm of scientific investigation. Whan an archaeologist digs in the sand and finds 3000 year old ruins and related artifacts – they are “claiming” that the artifacts are of such a nature that “the sand” and the surrounding geology do not account for them. They are claiming that the ruins show I.D. There is an active debate about the underwater Ruins off Yonaguni – essentially over the subject of Intelligent design – “or not”. Something fun to watch related to that point. But at no point do atheists or Christians argue that it is not “Scientific” to ask whether or not the Yonaguni site is indeed a artifact of man or of nature even though evolutionists would like to imagine that science never investigates those kinds of questions. I’m wondering why the Adventist Review published LSU’s above listed advertisement as the full back page cover of its latest World Edition? Don’t the staff at the Adventist Review know that they are contributing to the false impression LSU is trying to cultivate about their support of the SDA Church as an organization? – that they are actually subverting what the Church says it is trying to promote as basic fundamental pillars of the Adventist message? Eugene Shubert: Do you have a degree in a scientific field Bob? Victor, that answers a LOT of questions……and sure provides a lot of perspective too. Thanks! Not too surprising — The Adventist Review published a glowing review of Clay Peck’s “Grace Place” community church in Denver Colorado after sending one of their editors there to reveiw what was going on at Grace Place. The AR article came out the same month that Grace Place removed itself from Adventist fellowship. I don’t think AR is trying to make these mistakes – I just think their staff does not have the focus on doctrine and theology that many people imagine. I believe that to the degree you do see such a focus at the AR it is coming from contributors not from the marketing group or editors other than William Johnson. Err ummm… that is the “how” they focus on intelligent design .. and you left out scanners that employ signal-to-noise discriminators and pattern matching even to the point of music style scanning. ( But who’s getting sidetracked on the “how”?) My point is that the purpose is to dynamically “discover” the desired set of nearby radio stations (vs the undesired set of available screeching sources). And because those EM waveforms emitted by radio stations are I.D products rather than “the random acts of nature” – the point remains (regardless of the various signal attributes being monitored). Err ummm… that is the “how” they focus on intelligent design .. and you left out signal-to-noise discriminators and pattern matching even to the point of music style scanning. But who’s getting sidetracked on the “how”? My point is that the purpose is to dynamically “discover” the desired set of nearby “radio stations” (vs the undesired set of available screeching sources). And because those EM waveforms emitted by radio stations are I.D products rather than “the random acts of nature” – The point remains (regardless of the various signal attributes being monitored). It is a science based exercise in discriminating between I.D EM wave forms and background noise for the purpose of presenting only I.D. signals (regardless if the end result is 100% pure or not). The point is that the science exists and has a degree of success to the point of commercial viability. That’s a very clever way to condemn my opinion. You are imputing to me the empty boasts of the Intelligent Design movement, which is big on claims but has no results. When it comes to theology, science is the grammatical-historical method of interpretation. I have bookfulls of new results that agree with this science. Those are my qualifications. You should have cited those links. First I heard of ‘Grace Place.’ I don’t see anything remotely resembling any trappings of Adventism there at all. Only Sunday Services. BBQ Pork dinner on Thursday. Annual Easter Egg Hunt on a Saturday this year. A special Hungry Men’s breakfast with sausage on a Saturday morning. Young adult college Bible study group with coffee. They affirm the National Association of Evangelicals Statement of Faith. I would say they are trying their darndest to be anything but Adventist if they once were. Clay Peck shares his testimony, ‘My Journey Out of Legalism’ which chronicles his having been raised as an Adventist – only to later make a journey out of Adventism, disavowing its theology. He begins his story by saying some nice things about Adventists – however, the details of the story soon become filled with a profoundly negative and biased view of the Adventist church. He relates how he was fired as an Adventist pastor in 1997 after being interrogated by professors at Andrews for his lack of orthodoxy. This was also the year a number of ‘Evangelical’ Adventist pastors were likewise fired. It was at this time that Grace Place became ‘interdenominational.’ In 1998 He began to preach things contrary to Adventist Theology(Covenant Theology) and Grace Place separated more formally from the denomination. It was then that many members decided to return to the Adventist church. I would have to say that your news is a little dated Bob. Over 10 years old I’d say. Mr. Peck says that, “Grace Place was never an official Adventist church. We were called an â€œexperiment.â€ We were an experimental outreach project to reach out to former and inactive Adventists.” I’m reminded of the Colton SDA church many years ago that was lauded for its phenomenal numerical growth – comprised mostly of disenfranchised or disillusioned Adventists in Southern California. Now how does all this apply to the discussion here on educate truth? Often those who are raised in the Adventist church end up trying to effect a radical reformation of its theology or rebel completely against its beliefs in response to a pharisaeical form of Adventism. My contention is that many of those raised in the church are given a warped and unbalanced view of the true principles of Adventism and of God. Our church contains a preponderance of wackos and legalists of the worst sort. These spiritually destructive members are responsible for driving many people away from the Adventist church. Those who have been traumatized by a pharisaeical/legalistic misrepresentation of the everlasting gospel will seek refuge within a fellowship offering an inordinate emphasis on grace, for healing. On the other side of the coin our movement is a ‘holiness’ movement in the truer sense of the word. The carnal nature rebels against such a biblical emphasis and will gravitate toward an inordinate emphasis on grace for carnal refuge. Once again, what does this have to do with educate truth? I believe that the backdrop to professing Adventists embracing liberal theology, higher criticism and theistic evolution is an unbalanced response to a destructive form of Adventism. As a result, many Adventists (especially those raised in the church), reach out for a more ‘open-minded,’ ‘compassionate,’ ‘relevant,’ and ‘transparent,’ form of Adventism. In doing so they often become willing to throw the Adventist baby out with the dirty Adventist bath water. Those of us who would characterize ourselves as ‘conservative and orthodox’ Adventists, should search our hearts as to whether we have ever contributed to this dilemma in spirit, if not in word. “The strongest argument in favor of the gospel is a loving and lovable Christian.”–TSS 115, 116. Thatâ€™s a very clever way to condemn my opinion. You are imputing to me the empty boasts of the Intelligent Design movement, which is big on claims but has no results. When it comes to theology, science is the grammatical-historical method of interpretation. I have bookfulls of new results that agree with this science. Those are my qualifications. You should have cited those links. Surely you are not denying these revelatory credentials I quote from your web site. These would of course be the most preeminent qualifications in any field. My point about Grace Place was that it came to me as somewhat of a shock, that our AR staff would publish a glowing review of that church just as Peck was being asked to leave — in fact the very month. It was then that I took a closer look and found that most of the editors (in general) did not have training in theology at all — and since the recent comment about AR and advertising for LSU came up – it was simply a reminder that AR is not staffed to be a theological vetting ground. They follow policy and report the news and they also have good contributing articles. But beyond that – we should not get too excited about what might be advertised on the back cover – or what recently defrocked pastor may have just gotten a glowing review of AR. It was not intended as a criticism of some recent action by AR – just an observation over time. It is not unncommon to find a non-SDA site quoting some offbeat statement from AR and then claiming this is an official view of the Adventist denomination since it was published in an Adventist paper. There again – I sometimes have to remind them that AR does not have the theology-vetting function at the level that those sites have imagined. AR may be doing that on purpose in support of a degree of pluralism.